Image via “Smith Q&A” Facebook page. Design by jack laxson. The actions of the Smith College administration constitute a discriminatory bar against trans women. But after reaching out to over eight women’s colleges nationwide, it’s clear that such policies are not the exception but the rule. 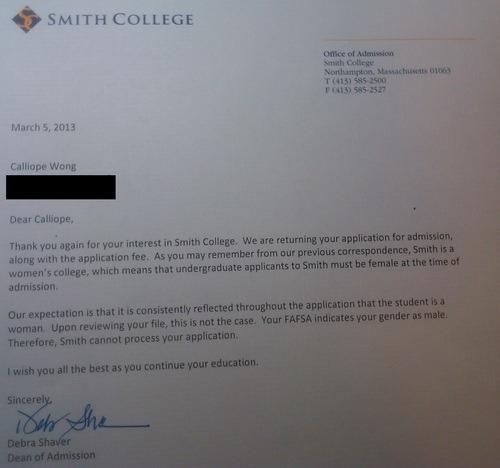 There are several aspects of Calliope’s experience that are particularly alarming and contribute to idea that the Smith College admissions policy constitutes discrimination against trans women. The case of Callope Wong is emblematic of a wider problem of cissexism and transmisogyny across the board at women’s colleges across the country. 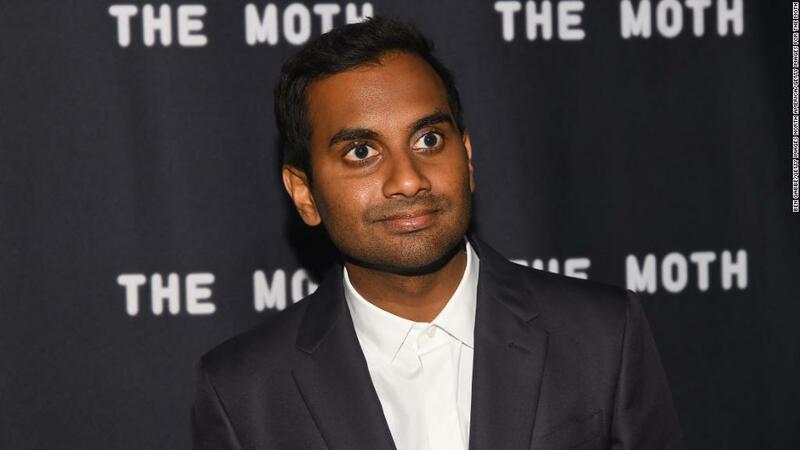 A number of schools declined to comment for this article, including Bryn Mawr, Mt. Holyoke, Chatham, Simmons, and Barnard. Spelman College, to its credit, had a spokesperson let me know that the College addresses admission for transgender and genderqueer students on an ad hoc basis, but emphasized that they admit “qualified female candidates without regard to race, color, religion, creed, national origin, age, disability, sexual orientation, marital or veteran status, or any other legally protected status.” They also sent me a few links to some of their notable work around LGBTQ rights. Wellesley wrote to let me know that they are “deeply committed to being a women’s college” and as such, they “admit women exclusively.” They also said that “once a woman has been admitted as a Wellesley student, we support all her choices and we celebrate her progress toward self-discovery.” This second part makes sense — if someone wants to transition while at a women’s college for example, they shouldn’t face getting kicked out of their school. But when pressed further to clarify if a trans woman would be considered for admission under this policy, they declined to comment. I find all of these responses sub-par and problematic. While I respect Spelman for being the only school I contracted willing to state for the record a policy of considering trans women applicants, it is not enough. Trans women should not have to guess and hope their way into fair consideration from women’s colleges as a matter of policy. 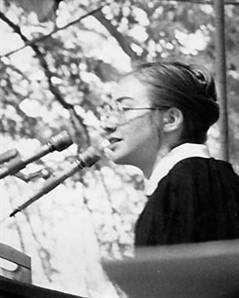 Hillary Rodham giving the commencement speech at Wellesley College, 1969. “Every protest, every dissent…is unabashedly an attempt to forge an identity in this particular age,” she said. It’s easy to forget that just 40 years ago, men’s only colleges were not just acceptable but the norm. Many colleges, including Harvard, Yale, and Georgetown, systematically and unapologetically excluded women throughout and sometimes beyond the 1960’s. Co-ed commencement exercises didn’t take place at Harvard until 1970, for example. These discriminatory policies didn’t just go away — they were pushed out by the advent of feminist activists demanding their right to quality education along the same lines as their male counterparts. It was in this context that many women’s colleges were founded, as alternatives to these men’s only spaces. 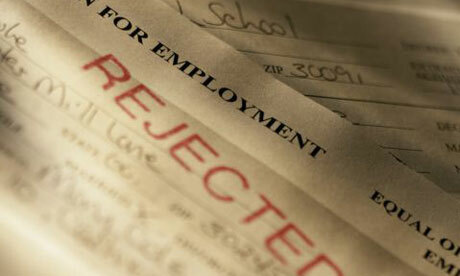 Women’s colleges offered women access to the higher education they were being denied elsewhere. They also played a large social and cultural role, coming of age in a time when feminist activism was rampant in America. Hillary Clinton has famously extolled the virtues of her Wellesley experience. Gloria Steinem is a graduate of Smith. Yet this “safe haven” aspect seems to be restricted to those who are assigned female at birth or become female-identified early in life. It’s ironic, then, that women’s colleges, having long played a pioneering role in feminist history, now find themselves on the other side of such feminist advocacy efforts. If anything is clear from Calliope’s case, it’s that these schools don’t need an explicit policy of exclusion towards trans women to achieve the same result. De facto transmisogyny is still misogyny. Women’s colleges should not be in the business of policing people’s bodies or identities, or deciding what kinds of people get to qualify as “women”. Many women’s colleges are already sites of inclusion for some trans and gender non-conforming folks, but this behavior should not be limited to certain kinds of trans* people. It’s both arbitrary and discriminatory to label a space as “for women” and then deny access for many women just because they were not assigned female at birth. 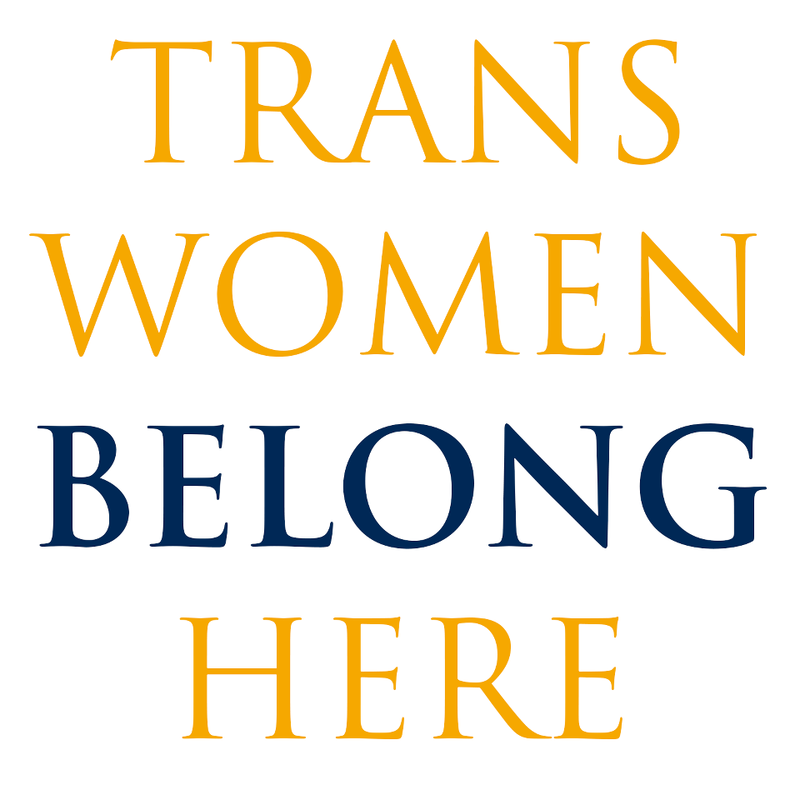 Stating this, and demanding that women’s colleges include trans women in the group “women,” is not akin to calling for the end of women’s colleges by any means. Rather, it is calling for a policy change that will strengthen and bolster the mission of women’s colleges and bring them back in line with the feminist activism of today. A Feministing Editor will be speaking on a range of topics, including this one, at Smith on April 6. Details are forthcoming. In the meantime, please feel free to direct letters [admission@smith.edu] or phone calls [413-585-2500] concerning this policy to Dean Shaver at Smith College Admissions. UPDATE: A trans woman has been accepted to the Simmons class of 2017. I applaud this move by Simmons. We need to keep up the pressure on Smith and other women’s colleges to not only follow suit in considering some trans women for acceptance, but developing a clear and consistent policy of inclusion towards such individuals. CORRECTION: This post originally included Stanford University in a list of schools that remained closed to women until the 1960s. The school has been open to women since it was established in 1891, however, it limited enrollment of women to a specified ratio.